Navigating life here at UC Berkeley is difficult for just about every student — we all juggle tightly packed schedules interwoven with back-to-back lectures and discussions, club meetings and more that leave our bCals looking like solid 12-hour blocks with no room to breathe. But the typical day of a Muslim student is even more complicated. Many Muslim students observe the five daily prayers in the midst of their busy schedules. Skipping prayer is no more an option than skipping class — this is a dilemma faced by many Muslim students on campus. This past fall, 2 percent of all incoming freshmen and 6 percent of all incoming transfers were Muslim, which may seem like a small number, but after having been on the board of the Muslim Student Association, or MSA, I can tell you that our Muslim community is vibrant and diverse. We are in need of support — not just from other Muslims on campus, but from the broader campus community as well. UC Berkeley needs to foster a culture of caring for all students, including Muslim students — we cannot portray ourselves as a truly welcoming, diverse campus until the same can be said for the treatment of Muslim students. A culture of caring can be promoted through creating and institutionalizing better accommodations for the lifestyles of Muslim students and acknowledging the diversity of Muslim experiences therein. There is only one dedicated space for prayer on campus, which is the Meditation Room in Eshleman Hall. While this room alone took years of effort from students to acquire, it should not be viewed as the solution to the lack of prayer spaces on campus but rather, the beginning of a series of solutions. While this is an excellent location for students with classes on the south side of campus, it leaves students stuck in other parts of campus longing for more. If the walk down to Eshleman isn’t feasible, Muslim students have to get creative. Common quick fixes include resorting to praying in whatever empty rooms we can find, praying in stairwells or even leaving class for a few minutes to pray in the building lobby once foot traffic has died down. A dedicated prayer space in each area of campus — north, center and south — however, is the best long-term solution to this issue. Furthermore, having only one space for worship on campus affects many other religious student organizations too. In my own experience, I have seen, on multiple occasions, the MSA having to end its events early and Sikh students beginning their worship late because we were only afforded one space. This is unfair not only to Muslim students but to all religious student organizations on campus. The additional prayer spaces do not need to be extravagant; rather, they simply need to be clean, quiet rooms that are easily accessible to the Muslims on campus — an empty classroom or meeting space would do the trick. Another important part of the Muslim student struggle is the quest for proper dining. For Muslim students in dorms, dining can be a hassle. Because they must purchase meal plans, they are confined to what the dining halls have to offer. The pickings are slim when you adhere to a halal and zabihah diet. Currently, of all the dining halls, only Cafe 3 has halal options. Eating this one halal option day in and day out, let alone multiple times a day, grows tiresome for Muslim students. If students are required to purchase meal plans to live in dorms, the dining halls should have more inclusive menus that account for all students’ dietary needs, including those of Muslim students. While the initial expansion of halal dining options may seem daunting, it can pay off in the long run — New York University recently made one of its dining halls completely halal, a move that has been met with praise. If students can eat a variety of meals that fit their dietary restrictions here at UC Berkeley, perhaps we’d see the same upward trends recreated on our campus. While I am calling on more agents with more power to take action and expand halal dining options and prayer spaces, we’ve already begun to make progress with the help of the South, Southwest Asian, and North African Initiative led by Doaa Dorgham. Within the ASUC, President Alexander Wilfert, Wilfert’s Chief of Staff Hanan Sinada and Senator Imran Khan — who represents the Middle Eastern, Muslim, Sikh and South Asian communities — have been working hard to bring these goals to fruition. This semester, we saw major headway regarding accommodations for fasting students during Ramadan, with more work to be done. After giving so many of my own personal anecdotes about ways in which UC Berkeley could support its Muslim students more, I’d like to emphasize that my own experiences as a Muslim student at UC Berkeley are just that — my own. American Muslims represent a myriad of beautiful and unique experiences; my own story is just one of them. American Muslims come from many different races, with the most prevalent groups being Black, white, South Asian and Middle Eastern Muslims. Having grown up in the East Bay, I can tell you that there is more to the local Muslim population than just the stereotypical concept of well-off Arab and South Asian immigrant Muslims — from Black Muslims who have been here for generations to Yemeni and Afghan communities that are beginning to take root. 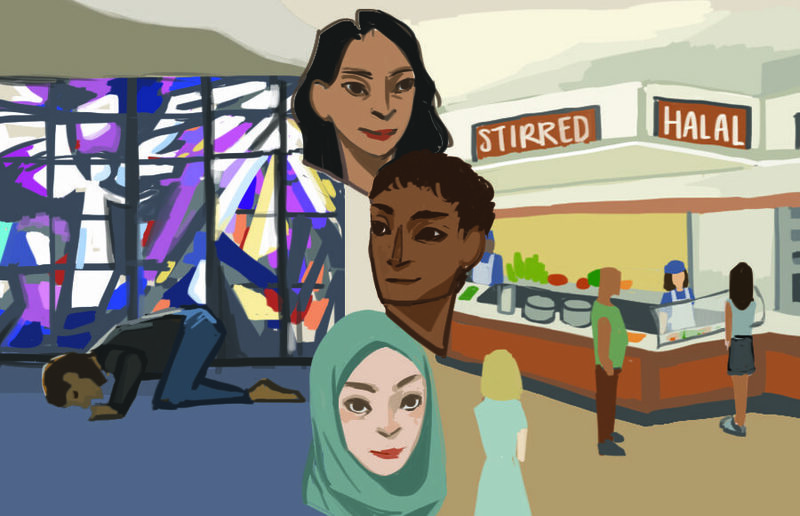 There are thriving communities that exist well outside of restrictive images of what Muslims should look like or be like, and many of those communities are part of the larger Muslim community here on campus as well — and we are better with them. Saneeha Shamshad is a junior transfer studying media studies at UC Berkeley and the communications director for the Muslim Student Association.